5546. Thelma Alvera MARTIN (Elizabeth Angela BLAKE , Mary Matilda BITLER , Daniel F , James , John , Johannes ). Thelma married Waveland Cyril HILL "Susie", son of Henry HILL and Anna SLOAN. Susie was born on 29 Nov 1910 in Latty, Paulding Co, OH. He died on 22 Dec 1941 in Paulding County Hospital, Paulding, OH. He was buried in St Paul Cemetery, Latty, Paulding Co, OH. Susie resides from 1910 to 1941 in Latty, Paulding Co, OH. He worked as Nickle Plate Railroad - Section Foreman in 1941. He worked as Auctioneer in 1941. + 10460 M i Russell Cyril HILL. + 10461 M ii Paul Henry HILL. + 10462 F iii Louella Imogene HILL. 5558. Ruth Phyllis FOCHT (James Dallas FOCHT , Susan Catherine BITLER , Daniel F , James , John , Johannes ). Ruth married William Seibert HAHN. + 10463 M i James Edward HAHN. + 10464 F ii Judith Anne HAHN. 5561. Floyd Willbe PRICE (Daniel Alexander PRICE , Sydney Margaret BITLER , Daniel F , James , John , Johannes ) was born on 20 Nov 1902 in MI. He died on 28 May 1973 in Fenton, Genesee Co, MI. Floyd resided in 1910 in Hamilton Twp, Clare Co, MI. He resided in 1920 in Hamilton Twp, Clare Co, MI. He worked as Farm Laborer - Home Farm in 1920. He resided in 1930 in 603 Fox St, Flint, Genesee Co, MI. He worked as Laborer - Auto Factory in 1930. He resided in 1940 in 1618 Belle Ave, Flint, Genesee Co, MI. He worked as forester - city parks in 1940. He was issued a social security number before 1951 in MI. Floyd married Dorothy May STONE in 1938. 10465 M i James Eugene PRICE. Gene Thomas PRICE 1 was born on 12 Jan 1941. He died on 3 Jun 2006 in Flint, Genesee Co, MI. Gene was issued a social security number in 1956/1957 in MI. He resided in Flint, Genesee Co, MI. 10467 F iii [Female] PRICE. 10468 F iv [Female] PRICE. 10469 F v [Female] PRICE. 10470 F vi [Female] PRICE. John Alfred PRICE was born on 5 Nov 1948 in Flint, Genesee Co, MI. He died on 14 Oct 2001 in Flint, Genesee Co, MI. 10472 F viii [Female] PRICE. 5564. Minnie M PRICE (Daniel Alexander PRICE , Sydney Margaret BITLER , Daniel F , James , John , Johannes ) was born on 12 Sep 1907 in Clare Co, MI. She died on 23 Aug 1982 in Saginaw Co, MI. She was buried in Pleasant Plains Cemetery, Harrison, Clare Co, MI. Minnie resided in 1910 in Hamilton Twp, Clare Co, MI. She resided in 1920 in Hamilton Twp, Clare Co, MI. She resided in 1930 in Hamilton Twp, Clare Co, MI. Minnie married Byron Frederick LYONS [scrapbook], son of John Lewis LYONS and Elmira SERSAW, on 21 Sep 1925 in Hamilton Twp, Clare Co, MI. Byron was born on 25 Jun 1892 in Clare Co, MI. He died on 5 Sep 1964. He was buried in Pleasant Plains Cemetery, Harrison, Clare Co, MI. Byron resided in 1900 in Hamilton Twp, Clare Co, MI. He worked as At School in 1900. 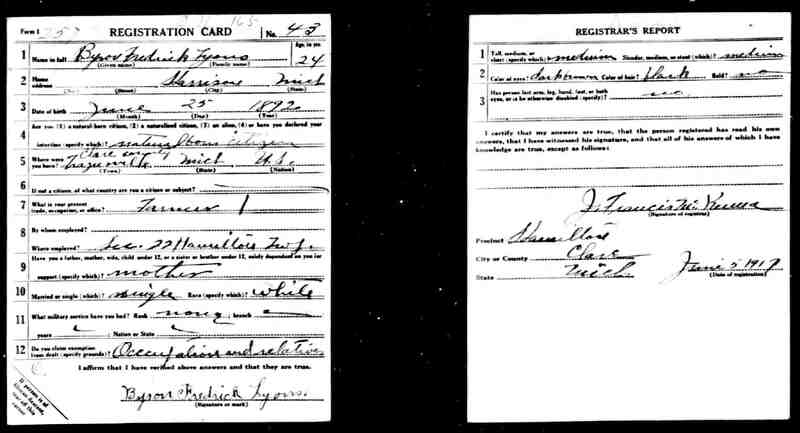 He resided in Jun 1917 in Harrison, Clare Co, MI. He worked as Farmer in Jun 1917 in Sect 22, Hamilton Twp, Clare Co, MI. He resided in 1930 in Hamilton Twp, Clare Co, MI. He worked as Farming - General Farm in 1930. + 10473 M i [Male] LYONS. 10474 M ii [Male] LYONS. 10475 M iii Fred LYONS. Harvey S LYONS was born on 26 Oct 1927 in MI. He died on 3 Sep 2001. He was buried in Hodge Cemetery, Hartland, Livingston Co, MI. Harvey served in the military with U.S. Air Force, Corporal in WW II. He was issued a social security number before 1951 in MI. He resided in Sep 2001 in Fenton, Genesee Co, MI. 10477 F v Ruth LYONS. 10478 F vi Yvonne LYONS. 10479 M vii Donald LYONS. 10480 F viii Clara LYONS. 10481 M ix Lydell G LYONS. 10482 F x Rosalie LYONS. 5566. Esther Irta "Esta" PRICE [scrapbook] 1, 2 (Daniel Alexander PRICE , Sydney Margaret BITLER , Daniel F , James , John , Johannes ) was born on 8 Oct 1911 in MI. She died on 8 Aug 1976 in Hamilton, Clare Co, MI. She was buried in Cedar Crest Cemetery, Hamilton, Clare Co, MI. Esta resided in 1920 in Hamilton Twp, Clare Co, MI. She resided in 1930 in Hamilton Twp, Clare Co, MI. She resided in 1940 in Hamilton Twp, Clare Co, MI. She resided in Dec 1948 in Clare Co, MI. She was issued a social security number before 1951 in MI. She resided in Aug 1976 in Hamilton, Clare Co, MI. Esta married Ellsworth George MILLER [scrapbook] 1, 2, son of George Eli MILLER and Theresa RAUCH "Tressie", on 25 Nov 1932. Ellsworth was born on 9 Feb 1899 in Monroe, MI. He died on 12 Aug 1979 in Clare, Clare Co, MI. He was buried in Cedar Crest Cemetery, Hamilton, Clare Co, MI. Ellsworth resided in Sep 1918 in Clare, Clare Co, MI. He worked as farmer in Sep 1918. He resided in 1930 in Hamilton Twp, Clare Co, MI. He resided in 1940 in Hamilton Twp, Clare Co, MI. He resided in Dec 1948 in Clare Co, MI. He was issued a social security number before 1951 in MI. He resided in Aug 1979 in Hamilton, Clare Co, MI. + 10483 M i William Ellsworth MILLER was born on 30 Jun 1924. He died on 10 Dec 1948. 10484 F ii Mildred MILLER. 10485 F iii Dorothy MILLER. 10486 M iv Alvin MILLER. 10487 F v Shirley MILLER. 10488 M vi Richard MILLER. 10489 M vii Larry MILLER. + 10490 M viii George E MILLER. 10491 M ix Paul MILLER. Ervin J MILLER [scrapbook] 1 was born in 1940. He died in 1962. He was buried in Cedar Crest Cemetery, Hamilton, Clare Co, MI. 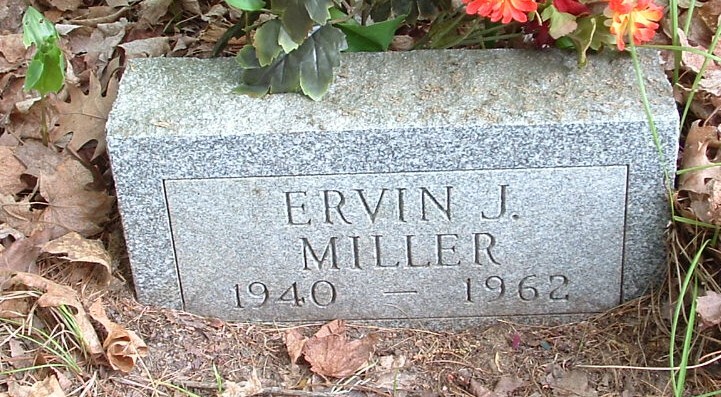 Ervin resided in Dec 1948 in Clare Co, MI. 10493 F xi Elizabeth MILLER. 10494 F xii Carol Ann MILLER. James J MILLER 1 was born in 1945 in Clare Co, MI. He died in 1945 in Clare Co, MI. 5567. 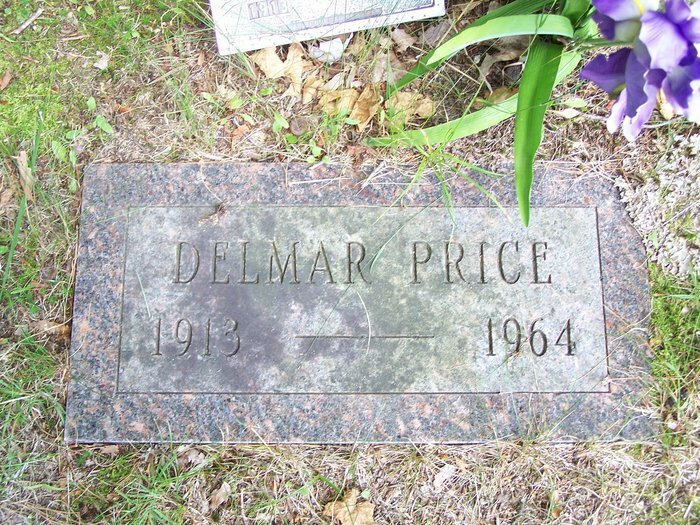 Delmar A PRICE [scrapbook] (Daniel Alexander PRICE , Sydney Margaret BITLER , Daniel F , James , John , Johannes ) was born on 21 Dec 1913 in Michigan. He died on 5 Apr 1964 in Midland, Midland Co, MI. He was buried in Cedar Crest Cemetery, Hamilton, Clare Co, MI. Delmar resided in 1920 in Hamilton Twp, Clare Co, MI. He resided in 1930 in Hamilton Twp, Clare Co, MI. He worked as Laborer - General Farm in 1930. Delmar married Katherine Bernice WILLADSON. Katherine was born on 24 Feb 1921 in MI. She died on 30 Apr 1976 in Lansing, Ingham Co, MI. + 10496 M i Carl Myron PRICE was born on 5 Jan 1939. He died on 14 Dec 2010. 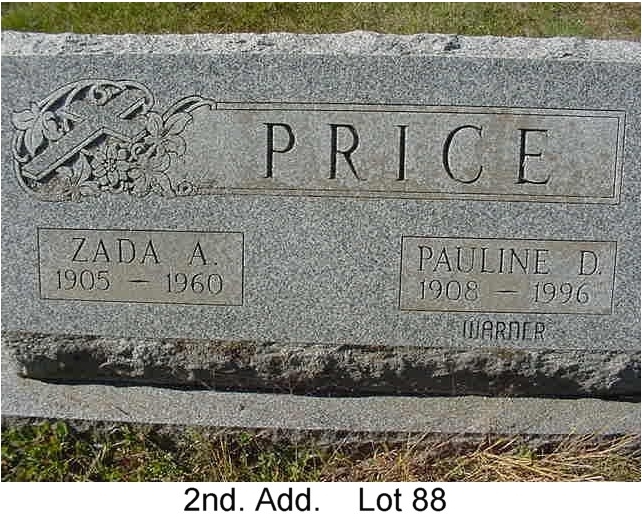 Ruth PRICE died in MI. Margaret PRICE died in MI. Charles "Chuck" PRICE was born in MI. He died in MI. 5570. Zada Alba PRICE [scrapbook] 1 (Leroy PRICE , Sydney Margaret BITLER , Daniel F , James , John , Johannes ) was born on 31 Dec 1905 in Harrison, Clare Co, MI. He died on 4 Sep 1960 in Midland Community Hospital, Midland, Bay Co, MI. He was buried in 1960 in Sect 2 Lot 88, Gilmore Township Cemetery, Benzie Co, MI. Zada resided in 1910 in Hamilton Twp, Clare Co, MI. He resided in 1920 in 575 Colfax St, Cadillac, Wexford Co, MI. He resided in 1930 in Lincoln Ave, Elberta, Gilmore Twp, Benzie Co, MI. He worked as Switchman - Railroad Yards in 1930. He worked with Ann Arbor Railroad Company. The cause of his death was injuries from a glider plane crash. He was a member of Benzie Sportsmen's Club (president, 2 terms). He worked as assessor with Village of Elberta. He was a member of Elberta Methodist Church (organist). Zada married Pauline Delia GONYON [scrapbook] 1, daughter of Adolph GONYON and Edith, on 2 Jun 1925. Pauline was born on 24 May 1908 in Waterville, Lucas Co, OH. She died on 19 Feb 1996 in Elberta, Benzie Co, MI. She was buried in Feb 1996 in Sect 2 Lot 88, Gilmore Township Cemetery, Benzie Co, MI. Pauline resided in 1930 in Lincoln Ave, Elberta, Gilmore Twp, Benzie Co, MI. + 10500 F i Gertrude I PRICE was born on 30 Oct 1925. She died on 2 Mar 1961. + 10501 M ii Lawrence Wilbur PRICE was born on 19 Jun 1927. He died on 20 Mar 1989. 10502 F iii Elaine Maxine PRICE. + 10503 M iv Roy Allen PRICE. + 10504 F v Thelma Edith PRICE. 5576. Thurman Devere PRICE 1, 2 (Leroy PRICE , Sydney Margaret BITLER , Daniel F , James , John , Johannes ) was born on 19 Oct 1922 in MI. He died in Nov 1982. Thurman resided in 1930 in 515 Colfax St, Cadillac, Wexford Co, MI. He served in the military with U.S. Army on 19 Jan 1943. He was issued a social security number before 1951 in MI. He resided in 800 Pleasant St, Grand Ledge, MI 48837-1347. He resided in Mar 1960 in Grand Ledge, Eaton Co, MI. Thurman married Justine Elizabeth SOMERS [scrapbook] 1, 2, daughter of Percy SOMERS and Jessie, before 1943. Justine was born on 22 Feb 1924 in Lincoln, MI. She died on 16 Oct 2004 in Jacksonville, AR. She was buried in Cadillac, Wexford Co, MI. Justine was issued a social security number before 1951 in MI. She resided in 2000 in 800 Pleasant St, Grand Ledge, MI 48837-1347. She resided from 2002 to Oct 2004 in Jacksonville, Pulaski Co, AR. She was a member of First Baptist Church in Jacksonville, AR. + 10505 F i Carolyn PRICE. + 10506 M ii Devere T PRICE. 5579. 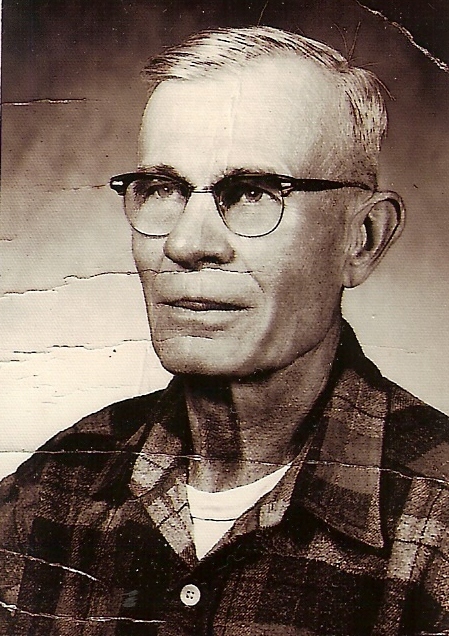 Carl Wilbert PRICE (William Harley PRICE , Sydney Margaret BITLER , Daniel F , James , John , Johannes ) was born on 5 Jun 1912 in Wapakoneta, Auglaize Co, OH. He died on 4 Jun 1990 in Waynesfield, Auglaize Co, OH. He was buried in Willow Branch Cemetery, Waynesfield, Auglaize Co, OH. Carl resided in 1920 in Tank Farm Rd, Bridgeport, Lawrence Co, IL. Carl married Nella Elizabeth HUTCHINSON 1, daughter of Albert G HUTCHINSON and Carrie V CONRAD, on 2 Oct 1933. Nella was born on 1 Jun 1918 in Waynesfield, Auglaize Co, OH. 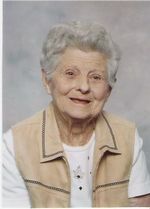 She died on 19 Oct 2001 in Wapakoneta Manor Nursing Home, Wapakoneta, Auglaize Co, OH. She was buried in Willow Branch Cemetery, Waynesfield, Auglaize Co, OH. Nella worked as production worker / inspector (31 yrs) with Westinghouse Electric Corp.. She was a member of Waynesfield United Methodist Church (52 yrs). She was a member of Chapter 273 Order of Eastern Star. + 10507 M i Gary W PRICE. + 10508 F ii Nancy E PRICE. 5581. Luella Marie PRICE (William Harley PRICE , Sydney Margaret BITLER , Daniel F , James , John , Johannes ) was born on 14 Nov 1915 in Lawrenceville, Lawrence Co, IL. She died on 29 Sep 1994 in St Rita's Medical Center, Lima, Allen Co, OH. She was buried in Memorial Park Cemetery, Lima, Allen Co, OH. Luella resided in 1920 in Tank Farm Rd, Bridgeport, Lawrence Co, IL. Luella married Ovia Phenias GOFF "Bub" on 25 Feb 1933 in Lawrenceville, Lawrence Co, IL. Bub was born on 24 Dec 1913 in Lawrenceville, Lawrence Co, IL. He died on 25 Nov 1995 in Wapakoneta, Auglaize Co, OH. He was buried in Memorial Park Cemetery, Lima, Allen Co, OH. + 10509 M i Rick GOFF. 5582. Mary Margaret PRICE (William Harley PRICE , Sydney Margaret BITLER , Daniel F , James , John , Johannes ) was born on 17 Mar 1918 in Lawrenceville, Lawrence Co, IL. She died on 4 Jul 1980 in New Port Richey, Pasco Co, FL. Mary resided in 1920 in Tank Farm Rd, Bridgeport, Lawrence Co, IL. Mary married Launis John CUMMINGS on 8 Mar 1935 in Waynesfield, Auglaize Co, OH. Launis was born on 26 Jun 1910 in Union Twp, Auglaize Co, OH. He died on 13 Apr 1972 in Lima, Allen Co, OH. He was buried in Willow Branch Cemetery, Waynesfield, Auglaize Co, OH. + 10510 M i [Male] CUMMINGS. Mary also married Virgil O MILLER. Virgil was born on 8 Jun 1915 in Lima, Allen Co, OH. He died on 15 Jul 1988 in New Port Richey, Pasco Co, FL. 5592. Myrtle Iva DECKER (Nannie Grace PRICE , Sydney Margaret BITLER , Daniel F , James , John , Johannes ) was born on 7 Jul 1914 in Gladwin, Gladwin Co, MI. She died on 22 Dec 1980 in Midland, Midland Co, MI. Myrtle resided in 1920 in East Wisconsin St, Mount Pleasant, Isabella Co, MI. She resided in 1930 in Pine River Twp, Gratiot Co, MI. Myrtle married Ted HAIR on 3 Mar 1933 in South Bend, St Joseph Co, IN. + 10511 M i Teddy HAIR Jr.
+ 10512 M ii Larry G HAIR. + 10513 M iii Rodney Rodger HAIR. 10514 M iv Steven HAIR.